When this update hits tq will you also replace the old star map? If so, what has been done to improve the new star map? 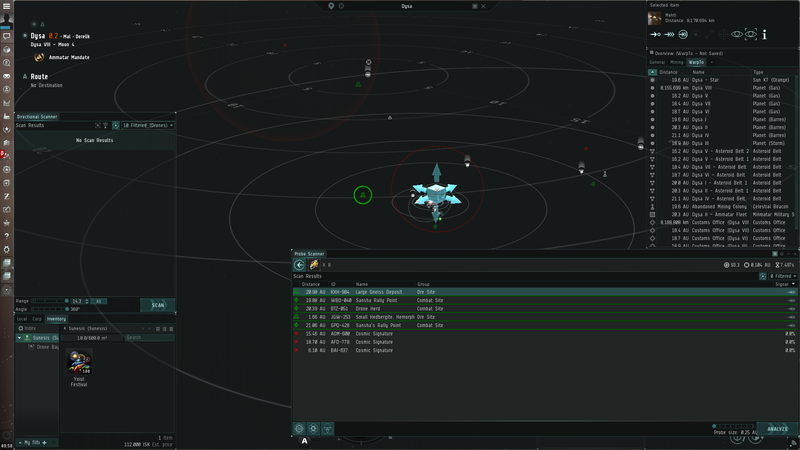 When using a hotkey including ALT to probe scan, the arrows from the individual probes are left as an atrifact when the scan goes on. Please don't remove the ability to resize the probes by clicking their edges completely. At least give a toggle to enable it. My friend has only one arm (amputated at the shoulder) and is incapable of using the keyboard and mouse at the same time, thus is physically incapable of pressing Alt or Control and using the scrollwheel at the same time. Granted, in this particular case, he has a mouse with multiple thumb buttons and is able to bind a side button to Alt and Control to assist him, but needing to rebind mouse keys to keyboard keys should not be forced on anyone. Anyone who has a basic 2 clicks+scrollwheel mouse, which I assume is what the majority of people would use to begin with, and happens to have some form of handicap making them unable to use keyboard and mouse simultaneously are essentially locked out of ever scanning. Nice updates, especially the double click to toggle top/side view. 1. One thing, however, is the window size of the solar system map, I usually like to tuck it down in the lower right hand part of the screen, and shrink it down to about 2x2 inches and then I increase as needed. Now you have the map locked to about 4x4 or even larger and it's too big to leave open at all times the way I do currently. Now I'll have to only open it when I'm ready to completely drop everything and focus on scanning probes, rather than how I used to multitask and always have the system map at the ready to view a thumbnail, as it were. Can you allow us to have more control over this window, and the ability to reduce the size down to as small as we need (or at least like 1 or 2 inches wide/tall)? 2. Any chance that the probes could simply target each signature when you select it in the list, rather than having to drag the square and probes over to the sig? That way, we could simply control the size of the spread and then hit analyze. It seems rather archaic that a spaceship with autotracking etc can't simply focus the probes on the signature that has already been identified and pinpointed on the map. 3. One more thing, it would be great to be able to toggle the transparency and/or color of the d-scan cone, because you've made it so bright that it blinds me from seeing anything else on the map!! Great stuff team, nice to see these updates. I like seeing the scanning difficulty when scanning a site down but it still pretty vague because doesn't say what skills would help make it less difficult or easier for pilots to scan the site down. There needs to be a option in the audio settings menu to disable each of these new sounds while I do like the bong sound for D-scan because it reminds me of AKIRA it's will eventually get old especially when someone is using these buttons on a daily basis. When i get the probe size down to 0.25AU or 0.50AU the U in AU is half under the analyze button no matter how large the width of either of those windows are. If you dock D-scan and the Probe scanner to the system map and then close it d-scan and the probe scanner do not come back when you use f9 to bring up the system map or using the new button in the scanner. it basically doesn't remember the docked positions. The system map should also boot up without D-Scan and Probe scanners Docked. On Directional Scan I can use the mouse wheel to scroll through the D-Scan Angle fine when hovering the mouse over it but when i hover the mouse over the AU Range control to use the mouse wheel to scroll up and down through it it gets stuck at 0.0 AU and doesn't come back up; it's only fixed by clicking on a range notch or inputting a new range in the range box. When you use the CTRL key with the mouse wheel down to focus the probes all down to one sphere it seems to get stuck there and you can't use CTRL+mouse wheel up instead you have to use the launch pinpoint or spread formation to fix it. 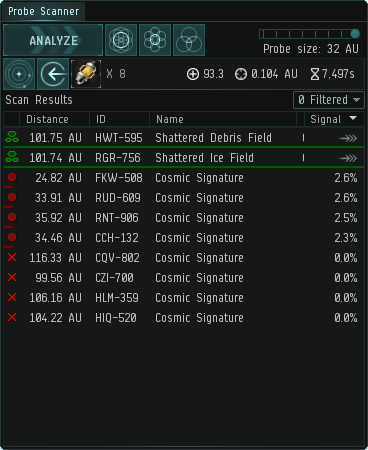 You guys have done somethings right and somethings very wrong with the D-Scan and Probe Scanner UI. Here is what I did in photshop to what I feel would make it function better. Thanks - but please raise a bug. It's great you're taking the time to let us know about this, but we need issues like this to be submitted as bugs through the game client to have the best chance of solving them. You can submit a bug in the game through the Help menu (F12). We appreciate you raising this with us, how the system can be used with one hand was something we talked about during the redesign. 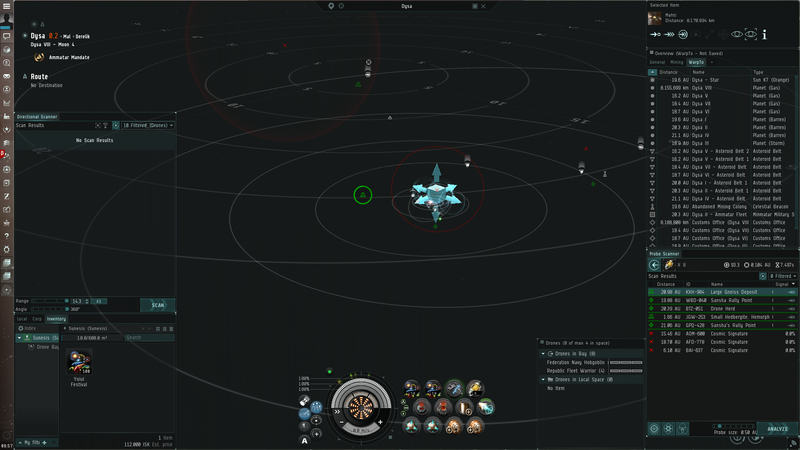 The new slider that's been added to the Probe Scanner window should enable your friend to be able to resize probes. If they have any trouble though we'd love to hear from them, and this forum thread would be the best place for them to leave some feedback. Unless CCP pulls some magic and the current SiSi implementation is outdated and fix, releasing this will be a disaster waiting to happen. SO much is wrong with these 'improvements' that it's not even funny. 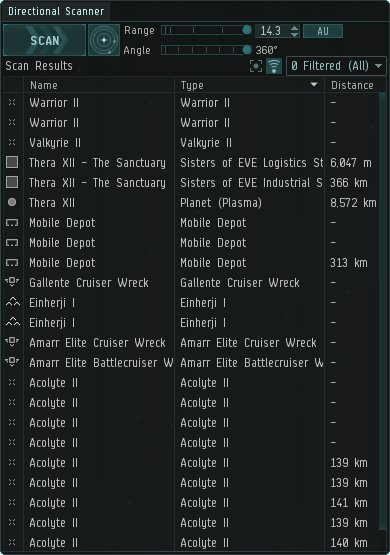 Bugs, the usual inconsistencies, a plain bad UI (re)design and then some will cause a _lot_ of pain for those of us who use these features and it seems that as a bonus CCP is removing the current system while leaving the legacy old-old stuff in. You have been warned, told, tweeted and can find two extensive live tests of the 'improvemnts' on evescout's Twitch stream.. Regardless.. I predict CCP will just press 'deploy'and break a major part of the game for a _lot_ of people. Is this still the place to give feedback on the directional scanner changes now that they have gone live? Currently this thread is in the test server section, but I couldn't find a more appropriate thread to reply to in the other sections. The only thing I want is to be able to use the "Directional Scan" hotkey with the old directional scanner. A viable alternative would be to use the new directional scanner if I could git rid of the visualization and shrink the window much smaller. I don't need the visualization. It doesn't help me. It is an obnoxious and annoying waste of screen space. I would use the new d-scan if I could turn the visualization off and shrink the window. When faced with the choice between using too much of my screen or having to manually click I gota chose to click. Do you know you can undock the probe and directional scanners from the solar system map and have both windows open without the solar system map appearing? There should be a little square in the title bar when they are docked. can we get the appearance of bookmark pins to stack with each other a bit less easily? This, basically. The button arrange in the new windows is dumb - everything you want to push is at the bottom, and all the things you never want to push are at the top. It's extra annoying that both of these windows default to opening the map when they're opened now - ESPECIALLY dcan, which i used 90% of the time without the map. It's also rather irritating that there's no map button on either window, except for the tiny little box which will turn the map on but not off. Edit - found the tiny button. PS - The dev notes on the new scan system said the buttons were rearranged to prevent accidental recalling of probes - so you should probably fire whoever put the recall probes button where the Analyze button used to be. The map feels like it slides around a lot now - an effect of the new animation system apparently. It's unpleasant, makes me motion sick, and feels like it slows down scanning while you're waiting for everything to resize. An option to turn this terrible feature off would be wonderful. The new color scheme where space is blue now for no apparent reason is rather unpleasant, and the cosmic signatures are almost invisible. Hitting V (the d-scan shortcut) no longer brings up the d-scan window.........why? Please do not take away the ability to resize from edges. I am sure this had a lot of discussion and there were benefits but from a user's perspective, you toke something away and replaced with an alternative that is not better. bring it back or give me option to use it. -ALT+Mousewheel is reversed. Put it like it was before changes please. Right now all sounds are controllable by the UI Interaction and Its not sufficient, we need more options. -Highlight on map only selected signatures and hide the others like it was before. Make the buttom that opens the Map Bigger like it was. Can you please either put all of the interface buttons/toggles/sliders at the top OR at the bottom instead of half top half down? Why does the system map have such a huge minimum size? Agree. Need to move the scan button to the top. That way when I minimize my direction scan I can click fast between tabs and rescan. I don't like the new version...i think its crap...but this would make it bearable. How can I turn OFF new sound, which is extremly anoying, and put back old sound, which was less anoying? Or, can i delete somewhere soundfile, or something? I underwent shoulder surgery recently and have the same issue, I'm currently playing Eve one handed and this change means scanning is just awful. The slider feels completely disconnected from the map, because it is (figuratively and literally). Resizing the bubble inside the map gives very direct visual feedback, I directly control its size in a very natural way, I can drag in and out to the exact size I need compared to the signature I'm scanning. Sliders are abstract, dragging a bubble to resize it is natural. I agree the bubble dragging has never been right, it gets in the way, it's annoying. A solution is having a specific little icon you drag in and out to resize, rather than just any edge. Even with the slider it has no labels, I have to just slide up and down to figure out where I am before settling into the size I want. And even with labels these are arbitrary numbers, a set of 'shrink' and 'grow' buttons would better reflect how scanning actually works, telling me the au is meaningless, there's no scale on the map. And even then my mouse has to criss cross back and forth across the screen, slowing things down a lot. It really feels like you put in the slider because it's consistent with how dscan works, not because it was better. The correct solution has already been posted, let us toggle it on or off. That would be ideal for everyone. This is not the kind of issue that has a 'right answer', some people like me play Eve under very different circumstances and we need these accessibility options. Other people don't. Give us the choice. Also, since I'm one handed I need to use the 'Open Map' button on the probe scanner rather than a hotkey, but you made it so tiny! This has been mentioned in this thread, but trying to hit that button with wrong-handed mouse control is so difficult. Took me a long time to type this with one hand, so I hope you listen. 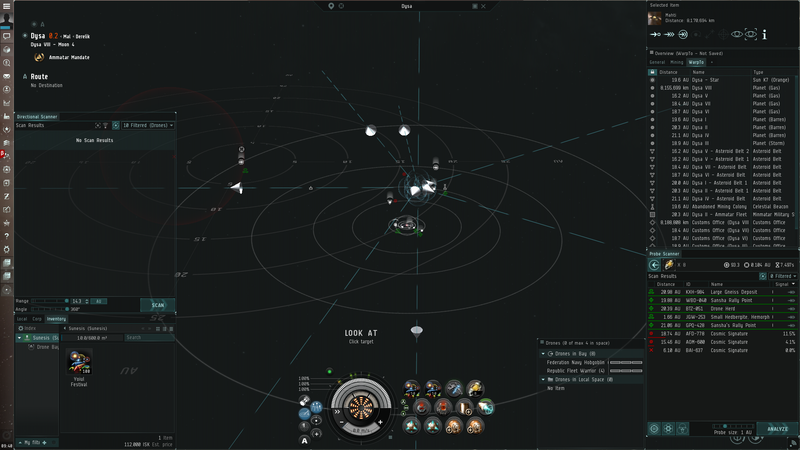 Eve was already hard enough for me to play, but now it's just so painfully awkward that I just can't do it anymore. It's not too bad overall one handed, but I do so much scanning that I need it to work. 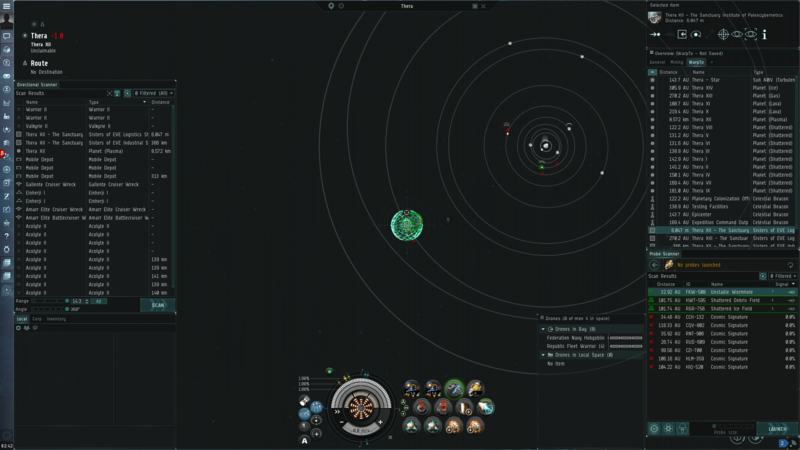 I'll have to take a break from Eve until my shoulder heals or the interface is fixed, and I hope it's the latter. Inverted mouse scroll is intentional, it matches with the slider up and down. This will be a case of your muscles re-learning. That slider is an abstracted representation of probe size and its "direction" is utterly meaningless, you can flip it or even just reverse the labels and it makes no difference. Using abstract UI to dictate natural interaction is absurd and counter to good UI design. That's why so many people are complaining, not because they "aren't used to it". I hope you'll reconsider,. 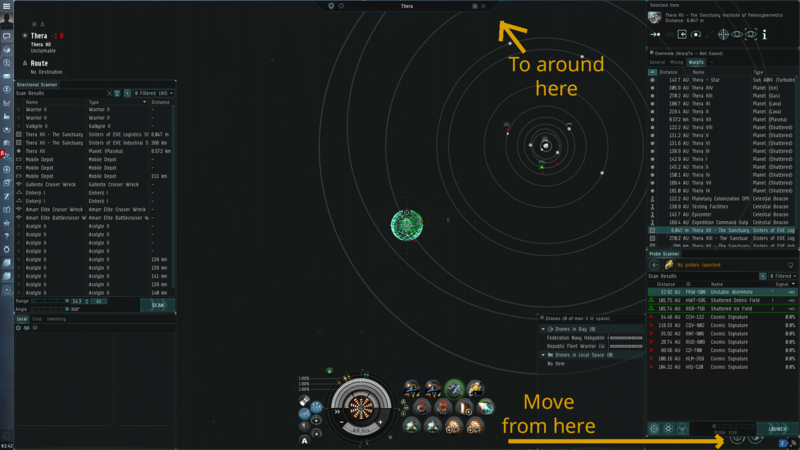 Please make this an option, I'm currently back on the old-old solar system map to have this back and be faster. I guess some prefer the key-enabling feature to resize because they might, sometimes, have issue clicking the right thing. Some other, like me, have issue when having to press multiple keys to do stuff.